So, what am I working on? First up is my project for the kids I babysit, which is actually a two-for-one as it will also be my December Island Batik ambassador project. 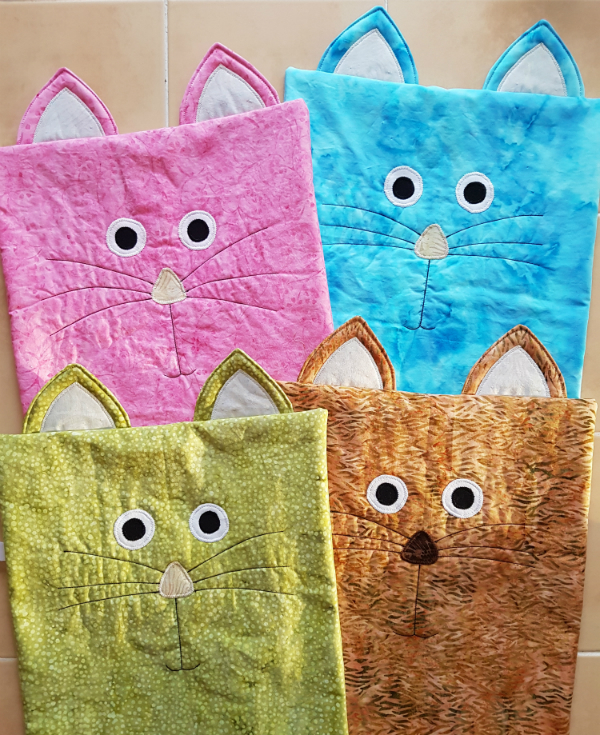 These positively adorable cats are on their way to becoming pillows and should be finished this week. My in-laws will be here Monday evening so ladder stitching the holes left for stuffing them will be the perfect hand stitching task for while we're visiting. The pattern for these is by Chris Malone and is in the Autumn 2018 issue of Quilter's World magazine. Then I have the cross stitch ornaments for my boys. Every year I make an ornament for each of my boys that reflects something important from their year. It's one of my favourite Christmas things and every year I'm surprised by how much they seem to enjoy it, too. However, I'd just like to say it's very hard to stitch for three people you live with when all three ornaments have to be kept secret from all three recipients! I can't share any pictures yet, just in case, even though one cross stitch is finished and another one is about half done. I don't think any of the boys ever come here, but Zach and Aiden are on IG now and might follow a link to the blog, so I don't want to take any chances. You can see last year's ornaments here and you can follow the link in that post to go back in time to older ornaments. It occurred to me a couple of days ago that when I started this tradition in time for Aiden's first Christmas, I only intended it to go until the year they're 18, which leaves me with only two years after this one for Aiden. I'm having trouble wrapping my mind around that. I'm also working on one bit of non-Christmas secret sewing, which I absolutely love. These are Island Batik fabrics again and aren't they beautiful? 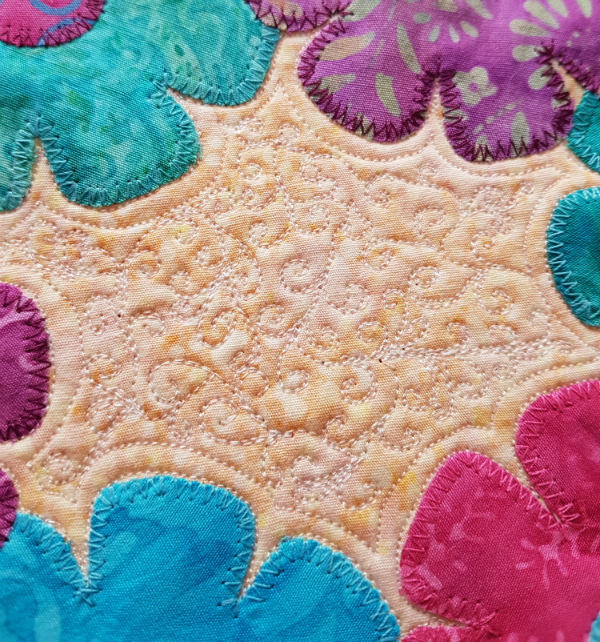 This is a 12" mini quilt so I'm expecting to have it finished and ready to mail soon. I try to make ornaments for my grandmother every year and some years I give away a dozen or more to friends and family. Last year it didn't happen, though I did get some gorgeous wood burned ornaments from a friend to give out. I haven't started yet this year, but I do have a plan. 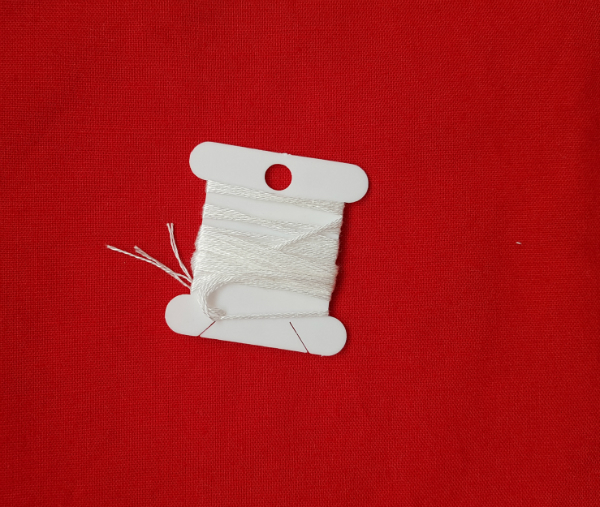 It involves red fabric, white embroidery floss and hand embroidery. Tick, tock, tick, tock...I better get a move on! Good thing ornaments are small! My mother-in-law has hinted rather strongly that she'd like some new placemats in lemon and lime colours, with navy. That's our plan for their Christmas gift, though at this point I'm pretty sure it won't be finished in time to go under their tree. I've debated for a while what design to use and finally I decided that when she's here on Monday she can help me plan. That way I know she'll love the end result and I'll stop waffling over the decision. I have a few people I'd like to make drawstring bags for, then add a few yummy treats to finish the gift. Good thing the bags are quick to make! I haven't decided yet if I should make the bags in Christmas fabrics or not, since Christmas fabrics would eliminate the need for wrapping but non-Christmas fabrics would mean the bags could be used all year. Decisions, decisions, right? The treats are no problem as I can make them with the kids I babysit, who love to help me with baking. I wonder how much I'll get done in time for Christmas. I really don't understand people who are bored, lol. I can't remember a time when my mind wasn't constantly thinking of all the things I would love to do, if only I had time to squeeze it all in! Christmas prep for me these days is in July. Very nice presents at your house. Merry Christmas! I usually do pretty good about making a few gifts early. However, next year I'm starting in February. I have three very close friends. I've never made them a quilt (other things, yes). They all live in Houston where the weather isn't the coldest in Texas. I want to make them Christmas quilts for combined birthday/Christmas gifts for 2019. 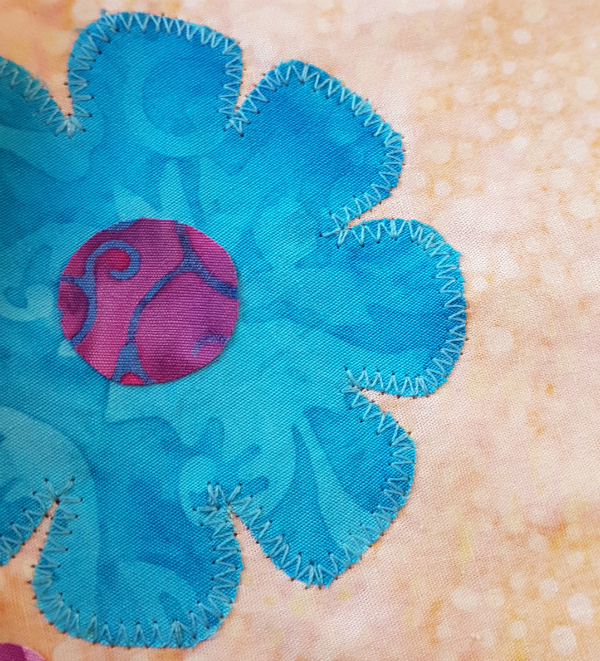 I'm going to my first away quilting retreat in February. I have all of my fabrics but I haven't pre-tested the block yet. I think I'm making all three the same but slightly different but we'll see because there's a lot of time to change my mind between now and late February!